R.W. Bro. Colonel Sir A.A. Weldon, C.V., D.S.O. 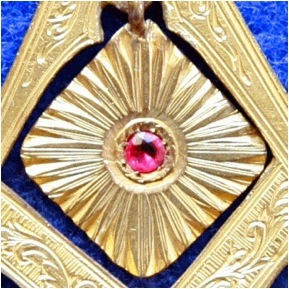 This is a Provincial Grand Master's Jewel and comprises of the Square and Compasses, the latter extended to 45 degrees with a segment of a circle at the points. 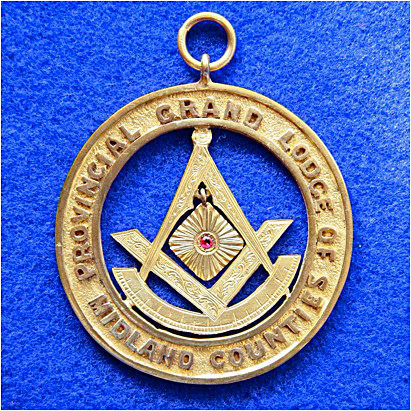 The Jewel is the same as the Grand Master's Jewel but enclosed within a broad Circle, on which is inscribed the name of the Province, namely "The Midland Counties." In the centre is a jewelled Sun irradiated. The Jewel is made of gilt base metal. The Reverse of the Jewel has the Makers Mark of "J.R. Ryan & Co, Dublin" a well-known Jeweller who at that time supplied Masonic Jewels. Short Biography of R.W. Bro. 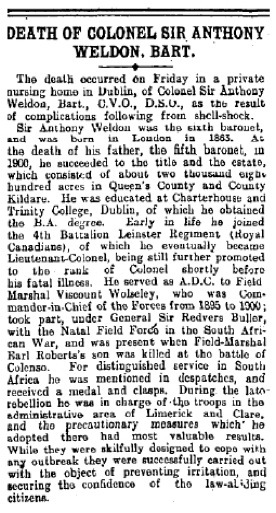 Sir Anthony Arthur Weldon, 6th Bart., C.V.O., D.S.O. Sir Anthony Weldon was a Member of Lodge No. 167, Athy, having joined the Lodge on the 19th July, 1886 from a Lodge under the English Constitution. He was appointed Provincial Deputy Grand Master of the Midland Counties in 1905, a position he held until 1913. Sir Anthony Weldon was appointed Provincial Grand Master of the Midland Counties in 1914, a position he held until his death in 1917. The Burdett, later Weldon Baronetcy, of Dunmore in the County of Carlow, is a title in the Baronetage of Ireland. It was created on the 11th July 1723 for Thomas Burdett, with remainder, in default of male issue of his own, to the male issue of his sister Anne, wife of Walter Weldon. 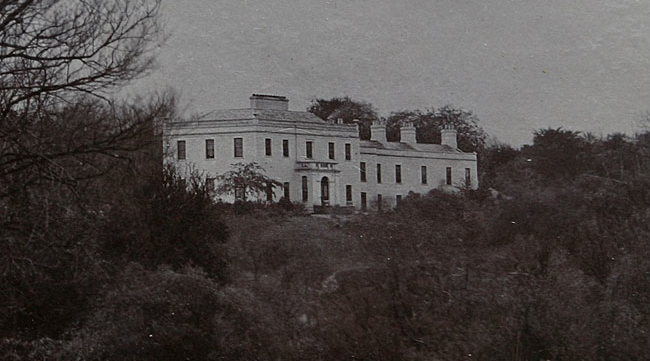 Kilmorony House was once the home of the Weldon family. Referred to as "Sportland" on the 1783 Taylor map of Kildare, Kilmorony was a fine Georgian house built some time after 1752 The main block was of two stories over a basement of five bays and a balustraded roof parapet and a lower two-story wing of four bays. The house was dismantled in the late 1930s. The coach house of Kilmorony has survived and is now a private dwelling. Sir Anthony Arthur Weldon, 6th Bt. was born on the 1st March 1863 at Oxford Square, Paddington, London, England. He was the son of Sir Anthony Crossdill Weldon, 5th Bt. and Elizabeth Caroline Thomasina Kennedy. He married Winifred Varty-Rogers, daughter of Lt.-Col. J. E. Varty-Rogers and Georgiana Florence Cooke, on the 11th February 1902 at St. Peter's Church, Eaton Square, London, England. Sir Anthony Arthur Weldon, 6th Bt. was educated at Charterhouse School, Godalming, Surrey, England. He was educated in 1884 at Trinity College, Cambridge University, Cambridge, Cambridgeshire, England, Bachelor of Arts (B.A.). Sir Anthony Arthur Weldon was Deputy-Lieutenant, Queen's County; Justice of the Peace, Queen's County and County Kildare; State Steward and Chamberlain to the Lord-Lieutenant of Ireland. 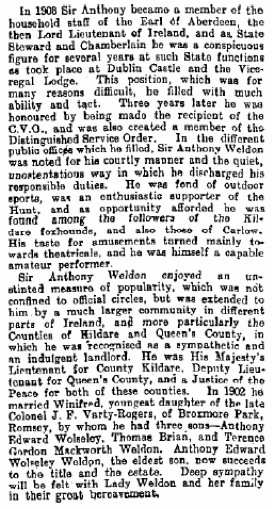 Sir Anthony Arthur Weldon succeeded to the title of 6th Baronet Burdett, of Dunmore, co. Carlow on the 14th January, 1900. 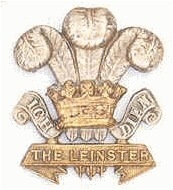 Whereas the Regiment had its origins in Canada, as the name would suggest, The Leinster Regiment (Royal Canadians) was one of eight Irish regiments raised and garrisoned in Ireland. Militarily, the whole of Ireland was administered as a separate command within the United Kingdom with Command Headquarters at Parkgate (Phoenix Park) Dublin, directly under the War Office in London. The Regiment served the counties of Longford, Meath, Westmeath, Offaly (King's County) and Laois (Queen's County), with its garrison depot at Crinkill, near Birr. Prior to World War I (WW1) there were 5 Battalions, two regular battalions, the 1st and 2nd with 3 Militia battalions. The 3rd was The King's County Militia, the 4th was The Queen's County Militia and the 5th was The Royal Meath Militia. Just prior to his death he was promoted to the rank of Colonel in the service of the 4th Battalion, Leinster Regiment (Royal Canadians). Sir Anthony died in 1917 from complications arising from shell shock, probably a stroke, which he received while fighting in France. The Weldon family was essentially a military one and many members served the British Empire in India, Africa and the Far East. Major Arthur Stewart Weldon, served in South Africa and the Great War and was killed in action in March 1917. His brother-in-law Colonel Croshaw died of wounds received in the Great War in September 1917. The old British Legion Hall in Naas (Now the Scout Den) was dedicated to their memory. 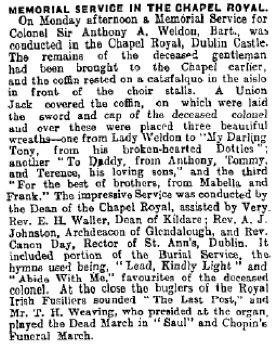 You will also note from the above article of the Irish Times Saturday Edition of the 7th July, 1917 that the chief mourners were stated to be his brothers Lieutenant-Colonel Weldon and Major Weldon.